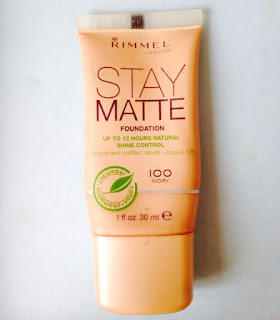 I have been meaning to do a blog post about Rimmel Stay Matte foundation for a while now but haven't gotten around to doing it. It's one of the first foundations that I tried but since trying a lot of skin care products it's not as good as I once thought. Trying it on for the first time in a while, I remembered why I stopped using it, it just did not feel right on my skin and was quite patchy. I have the lightest shade Ivory (100) and felt that it looked a bit orangey, there also wasn't much of a matte feeling and it dried up my skin a little. Since becoming more obsessed with beauty products, I have become more perceptive and critical of makeup and to ensure it matches my skin tone. However, this is the only product of theirs that I have had any negative views on, I absolutely adore their powder and have used it for years. Their lipsticks and lip glosses are awesome, especially their Kate Moss range.